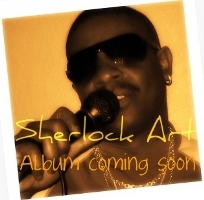 "Sherlock Art undeniable talent and lyrical dexterity has taken him to one of Jamaica’s biggest music producer, Bobby Digital, who then invited him to Kingston to his recording studio. Unfortunately he was on a very long waiting list with more well known reggae artist waiting to record songs but at the same time it was the best experience he could wish for at that time, seeing the other artist doing their work in the studio. In 2002, he moved to the UK and worked in the industrial business while working and singing every day. Colleagues would always suggest to him to go on talent shows but Sherlock Art was never interested in doing that, he wanted to find out more about UK music and settle down to a new life in 2006. In 2009 he began recording his first official album"
1). Do you have a phobia? If yes - what? 2). If you wouldn't have become an artist, what would you be? Lifeguard, because before i came to the UK i was a qualified lifeguard in Jamaica. 3). What is your "formula for success"? 4). If you had a chance to perform a live concert in any of these 3 countries: India, Congo, Iraq - what would it be and why? It would be Iraq.Bring the people together. A massive one love concert. 5). If you started a social networking project/website, what would you call it? Listen to: Sherlock Art - "luv U 2nite"